The mall opened in 1991 and has been enhanced several times. The most recent development was announced in 2011 and completed in September 2016. The latest project added more than 200 stores to mall’s retail portfolio. New additions included H&M, Next, and Mothercare. A Carrefour hypermarket opened on the Ground Level in 2014. Another key element was the expansion of the Level 3 entertainment and dining area. VOX Cinemas BurJuman opened in 2015. Magic Planet, a family entertainment centre, opened at the beginning of 2016. A new food court on the same level includes outlets such as Burger King, Texas Chicken, Koryo, and Umami. Shops at BurJuman are listed below. The list was last updated on March 1, 2019 . 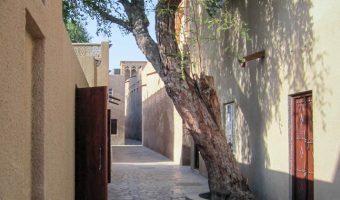 Abu Haleeqa – Arabic menswear and textiles. Adams Kids – Children’s clothes. Ahmed Seddiqi & Sons – Swiss watches. Al Futtaim Watches & Jewellery – Jewellery and watches. Al Ansari Exchange – Offers foreign currency exchange and money transfer services. Al Ghurair Exchange – Foreign exchange and remittance services. Al Ghurair Int’l Exchange – Foreign currency exchange and money transfer services. Alpha Optical – Frames, contact lenses, and sunglasses. Athlete’s Co. – Casual and sports footwear. Baldinini – Italian footwear, bags, and accessories. Bateel – Gourmet dates and confectionery. Bath & Body Works – Bath and shower gels, skin care products, soaps, fragrances, home fragrances, candles etc. Beverly Hills Polo Club – Fashion. Big Bus Dubai – Sightseeing tours of the city. Call It Spring – Footwear and accessories. Calvin Klein Underwear – Designer underwear for women and men. Canali – Menswear from Italy. Carpisa – Handbags, suitcases, briefcases, and accessories. Carter’s – Clothes and accessories for babies and children. CAT – Shoes and clothing. Champion Cleaners – Dry cleaning and laundry. Charming Charlie – Jewellery and accessories. Chopard – Jewellery and watches. City Sightseeing Dubai – Hop-on and hop-off bus tours of Dubai. Cotton On – Australian fashion brand. Daiso – Japanese discount store offering a wide range of products including glassware, cutlery, crockery, kitchenware, cosmetics, stationery, and toys. Da Milano & Rosso Brunello – Leather goods and footwear. Desco – Copying and printing. Early Learning Centre – Educational games and toys. Emirates Driving Institute – Driving school. Eros – Electronics, IT, and appliances. Fabindia – Handcrafted home furnishings, clothes, textiles and other products from India. Foot Locker – Sneakers and sportswear. G2000 – Office clothing for men and women. Garage – Fashion for teenage girls. Gianfranco Ferre – Clothing and accessories. GNC – Vitamins, minerals, sports nutrition and diet products. Good Health Nutrition – Food supplements, vitamins etc. Hang Ten – Surf-inspired clothing and footwear from California. Herschel – Backpacks, bags, and travel accessories. HiPhone Telecom – Mobile phones and accessories. Hush Puppies – Casual footwear. Icing – Women’s jewellery and accessories. Jafferjees – Handcrafted leather goods. JBL – Speakers, headphones etc. Jewellery Spot – Jewellery store. Just Accessories – Fashion accessories. Layal – Cosmetics and fragrances. Lifestyle – Home furnishings, home décor, cosmetics and perfumes, fashion accessories etc. Lifestyle Nutrition – Food supplements, vitamins, hair care products etc. Marcha Ballerina – Women’s shoes. Matalan – Discount store offering clothes, footwear, and accessories for all the family. Merrell – Footwear and outdoor clothing. Miniso – Japanese concept store offering a range of products including household items, kitchenware, gift, bags, fashion accessories etc. Mobile Outfitters – Mobile phone screen protection. Montblanc – Luxury writing instruments, jewellery, watches, leather goods, eyewear etc. Mothercare – Maternity clothes, nursery furniture and bedding, pushchairs, car seats, baby feeding products, toys etc. Nine West – Women’s shoes and accessories. Occhiali – Designer frames, contact lenses, and sunglasses. Pan Emirates – Home furnishings. Prima Diamond – Jewellery store. Pumpkin Patch – Children’s fashion from Australia. Rituals – Cosmetics, body care products, home fragrances, candles etc. Ritu Kumar – Womenswear by Indian designer Ritu Kumar. Rivoli Eyezone – Designer frames and sunglasses. Rivoli Prestige – Luxury watches. Samsonite – Suitcases, bags, and travel accessories. Samsung – Mobile phones, cameras, home appliances etc. Sebago – US boat/deck shoes for men and women. Smoker's Centre – Cigarettes, tobacco, cigars, and smoking accessories (pipes, cigarette holders etc.). Super Trim – Men’s hair salon. T.M.Lewin – Shirts, suits, ties, and accessories. The Body Shop – Ethically-produced cosmetics, fragrances, hair products, body lotions and scrubs, toiletries etc. The Children’s Place – Childrenswear. The Face Shop – Korean cosmetics brand. The Toy Store – Toys, games, nursery products, and outdoor play equipment. Typo – Gifts, stationery, and art. U.S. Polo Assn. – Polo-inspired fashion. uniCare Medical Centre – Health clinic. Versace – Fashion, luxury accessories, fragrances etc. XIMI VOGUE – Fashion boutique. Baskin Robbins (Ground Level) – Ice cream and desserts. Bombay Chowpatty (Level 3 Food Court) – Indian. Burger King (Level 3 Food Court) – Burgers and fries. California Pizza Kitchen (Ground Level) – Pizzas and pasta. Charleys (Level 3 Food Court) – Philly steaks and grilled subs. Chinese Palace (Level 3 Food Court) – Chinese fast food. Cold Stone Creamery (Ground Level) – Ice cream and desserts. Dome – Casual cafe. Menu includes breakfast, baked goods, soups, salads, sandwiches, and desserts. FiLLi – Cafe specialising in tea (Ground Level). Fruitpunch (level 1) - Fresh juices and smoothies. Gloria Jean’s Coffees (Level 2) – Cafe offering hot and cold beverages, sandwiches, wraps, salads, and baked goods. Jollibee (Ground Level) – Fast food restaurant. Menu includes burgers, fried chicken, chicken sandwiches, and hot dogs. Keventers (Level 3 Food Court) -Milkshakes. KFC (Level 3 Food Court) – Fried chicken. Koryo (Level 3 Food Court) – Korean. Krispy Kreme Doughnuts (Ground Level) – Doughnuts and beverages. London Fish & Chips (Level 3 Food Court) – British fish and chips. Marry Brown (Level 3 Food Court) – Fried chicken. McDonald’s (Level 3 Food Court) – Burgers and fries. Noodle House (Level 3) – Asian restaurant. Pancake House (Ground Level) - American. Papa John’s (Level 3 Food Court) – Pizzeria. Pizza Hut (Level 3 Food Court) – Pizzeria. Shamiana (Level 3 Food Court) – Indian fast food. Smoothie Factory (Level 2) - Smoothies. Spices Garden (Level 3 Food Court) – Offers an Indian vegetarian menu. Starbucks (Level 1) – Coffeehouse. Subway (Level 3 Food Court) – Subs. Tangerine (Ground Level) – Asian restaurant. Tapa King (Level 3 Food Court) – Filipino. Texas Chicken (Level 3 Food Court) – Fried chicken. The Orchestra – Lebanese cafe. Menu also includes pasta, pizza, and burgers. Indoor and outdoor seating areas. The Yellow Chilli (Level 3) – Indian restaurant offering a menu by Sanjeev Kapoor. Tim Hortons (Ground Level) – Offers breakfast, baked goods, wraps, sandwiches, and beverages. Umami (Level 3 Food Court) – Japanese. Wrapchic (Level 3 Food Court) – Wraps and burritos. Yogurberry (Level 3) – Cafe offering frozen yoghurts, smoothies, and juices. Yo! Sushi (Level 3) – Japanese. Customer service desks offer maps and store guides, event and transport information, shopping vouchers, concierge and lost and found services, and gift wrapping. Other facilities and services at the mall include toilets, baby changing areas, luggage storage, and prayer rooms for men and women. Numerous ATMs are dotted around the mall. There’s also a branch of the Emirates NBD here plus several currency exchange centres. BurJuman is open every day of the week. Store opening hours are 10 am to 10 pm Saturday to Wednesday, and 10 am to 11 pm on Thursday and Friday. Restaurants close one hour later. 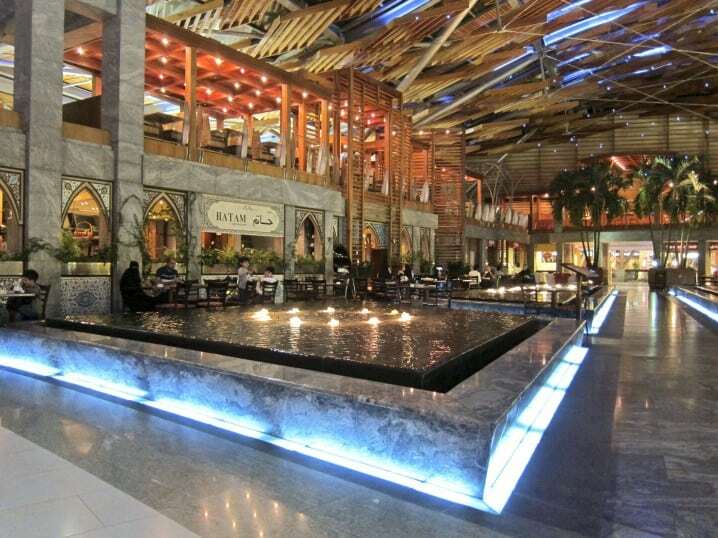 The mall is situated in Bur Dubai at the junction of Sheikh Khalifa Bin Zayed Road and Khalid Bin Al Waleed Road. There are pedestrian entrances on both roads. The car park is situated on the ground floor of the mall. Entrances are on Sheikh Khalifa Bin Zayed Road. Valet parking is available. 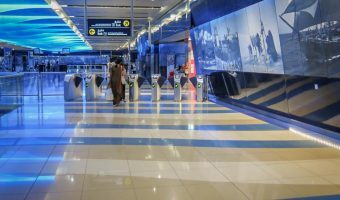 BurJuman enjoys easy access to the Dubai Metro system with BurJuman Metro Station right outside the main entrance. It’s a transfer station on both the Red Line and the Green Line offering quick and easy access to and from most areas of the city. 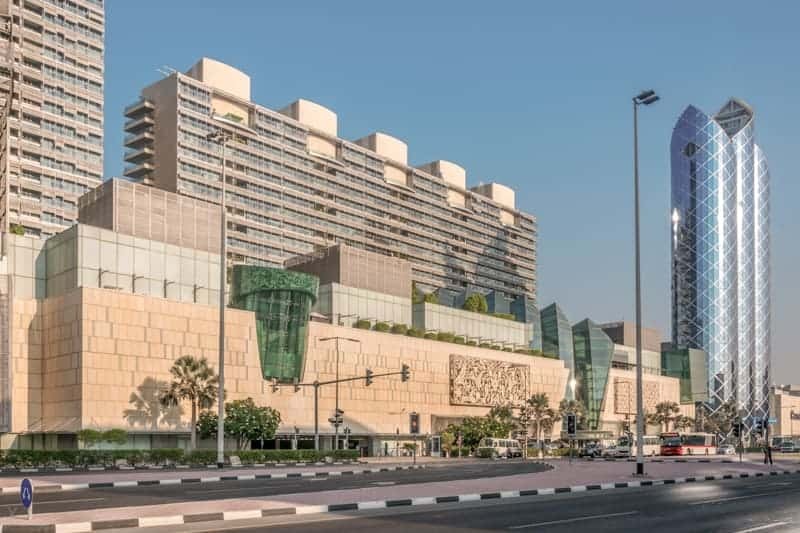 The BurJuman Arjaan by Rotana hotel is connected directly to the mall and offers 148 suites, ranging in size from one bedroom suites to a four bedroom penthouse. The hotel also offers numerous conference and meeting rooms plus a rooftop swimming pool. Other hotels and places to stay near BurJuman include the Four Points by Sheraton Bur Dubai, the Four Points by Sheraton Downtown Dubai, Xclusive Hotel Apartments, and the Majestic Hotel Tower. Map showing location of BurJuman. Xti, XIMI Vogue and FiLLi now open at Burjuman. Magic Planet now open at BurJuman. Mikel coffee shop now open on the ground floor of the new BurJuman extension. Alpha Optical now open at BurJuman. Offering frames, contact lenses, and sunglasses. You forgot to mention Dolce and Gabbana, Hermes, Dior, Prada, and Vertu. It’s not mentioned here but BurJuman also have a Saks Fifth Avenue, one of the most complete and beautiful stores to shop. The ambiance is good as are the coffee shops in the new Burjuman extension. This may sound a little strange but you may actually need to pack a coat if you intend to visit any of Dubai’s malls. The air conditioning makes them really, really cool!